StarTrek.com has the details on Captain Picard and company’s arrival on BluRay early next year. In January 2012 a sampler disc with several remastered episodes will hit store shelves, and throughout the year entire seasons of the beloved series will become available. After the effects were redone for the original Star Trek on Blu, many figured the same fate would befall TNG, and they were right to assume so. Effects will be updated and the episodes are being re-edited for film. When the series originally aired episodes were shot on film but cut on video. For the HD transfer Paramount is returning to the original film negatives, a mountain of material made up of 25,000-plus reels of footage. and editing the episodes together precisely as they were when they originally aired from 1987 and 1994. The freshly cut film will then be transferred to high definition with 7.1 DTS Master Audio. Star Trek: The Next Generation hits shelves January 31st, 2012. 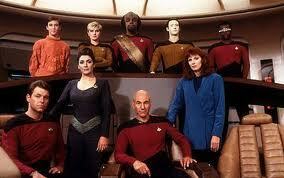 Comments for “Star Trek: The Next Generation” Set To Beam On To BluRay are now closed.